Students will be introduced to traditional Outer and Inner Qigong from two systems: the Pre-celestial Limitless Gate School (Xiantianwujimen) and the Yiquan School. This is through the lineage handed down by Dr. Eva Wong. Xiantianwujimen was founded in the Song dynasty (circa 10th to 12th centuries) by Daoist sage Chen Xiyi, who is recognized as "the father of qigong." Eva Wong is the 19th-generation carrier (quanren) of this lineage. The Yiquan School was founded by Wang Xiangzhai in the early 20th century. Yiquan is best known for its standing qigong postures called Zhangzhuan. One of Master Wang's students was the Luhe Bafa master Sun Di. Acharya Duquette has received the transmissions from Dr. Eva Wong. The Tiger and Dragon postures from the Wudang Shan lineage of Five Internal Animals Training (tiger, dragon, leopard, snake, and crane forms). The Tiger form builds bone strength, and the Dragon form trains the union of spirit and body. In addition, by immersing themselves in the spirit of these animals, participants will eventually come to embody the patience of the crouching tiger stalking its prey and the playfulness of the dragon frolicking in the sky. Part 2 of the Immortals' Guide to Self-massage and Breath regulation. This system combines self-massage and breath control to facilitate the conservation and circulation of internal energy. Part 2 of Chen Xiyi's Red Phoenix Calisthenics System. This system combines tendon-changing, calisthenics, self-massage, and breath regulation. The last two postures of Zhangzhuan (Standing Qigong). Please plan on arriving between 4pm and 6pm on April 26, 2019, to check-in and register. Dinner is offered at 6:30pm. The program begins at 7:30pm. The program will end at 6pm on April 28, 2019. Traditional Chinese Qigong: Levels 1 - 3. Students attending Level 4 are expected to continue onto at least Level 5 in order to complete the entire Red Phoenix Calisthenics System, the Immortals' Guide to Self Massage and Breath Regulation, and the Five Internal Animals Training. 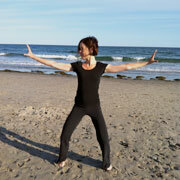 Sophie Léger is one of few individuals authorized and trained by Dr. Eva Wong to teach her Taoist Qigong lineages. Over the last 9 years, Sophie has traveled extensively, offering qigong levels 1-2, 3, 4, and 5 to hundreds of people throughout North America and Europe. A student of Sakyong Mipham Rinpoche since 1990, Sophie also has been a certified meditation instructor and teacher in the Shambhala Buddhist tradition for over 20 years. She currently works for Kalapa Media as Director of Translations and lives in Massachusetts.